← Bottom-Up Is Not Enough! Predictions by the Intergovernmental Plan on Climate Change (IPCC) and most scientists, strongly suggest that we may be creating our next genocide ourselves; a “business as usual” scenario over the next 70 years (the expected lifespan of my grandchildren – my definition of “Now” in the book) will result in doubling of greenhouse gas emissions. Emissions at these levels would result in major extinctions around the globe, with more than 40% of ecosystems destroyed. The belief that we are not part of the ecosystems is a dangerous hubris. We have just passed the 7 billion population mark and even if we take the 40% prediction with a large grain of salt, we are talking about the potential genocide of billions of people. Arnold Toynbee wrote that civilizations die from suicides, not murder. Even if the predicted consequences of “business and usual” environmental scenarios over the next 70 years turn out to be wrong in some details and even slightly wrong in timing, it’s clear that once we pass a critical point in the ability of the planet to adapt to the accumulation of greenhouse gasses in our atmosphere, the consequences amount to global suicide – a self-inflicted genocide. We know what we must do to mitigate this possible future genocide, but we need our collective will to do so. We can’t allow the deniers to win again. My main purpose in using the term was to try to establish a clear marker of direction. The example that I gave was the Paris Metro, where each train line is identified by its end point. There is (I hope) a universal agreement that genocide is an utmost evil that must be avoided or dismantled via our collective international resolve. In this sense, my use is fully consistent with the UN use of the term and with the original Lemkin intention. The main indicator that I am making some impact in the right direction is that almost five years after I coined the application of the term on this blog it continues to be a focus of discussion – case in point: my talk in Philadelphia. All of this was directed at the future – if we continue business as usual, these will be the consequences. I am trying to provide motivation to change our direction. Recently, I have found the need to broaden the self-inflicted concept to an even more inflammatory idea: collective treason. This motivation came as a result of our newly elected federal administration’s apparent attempts to purge the government of people with enough science education to undermine the increasing human influence on the physical environment. A Republican state senator running for governor of Pennsylvania shared some unusual views this week about what’s causing climate change. Scott Wagner told a Harrisburg audience on Tuesday that the body heat from the planet’s growing population might be responsible for rising temperatures. The lawmaker was speaking to a receptive audience of rural county officials about loosening regulations on the natural gas industry. At another point, Wagner appeared to conflate global warming with … well, it’s not quite clear what he meant. Anybody interested in body heat in France can refer to my January 7, 2013 blog. WASHINGTON — Rep. Lamar Smith (R-Texas), chairman of the House Committee on Science, Space and Technology, has challenged the credibility of Science magazine — one of the world’s most respected science publications. “That is not known as an objective writer or magazine,” Smith said during a hearing Wednesday on climate change, which Smith denies. To Smith’s assertion that Science magazine is not objective, Mann responded, “Well, it’s Science magazine.” Science is a publication of the American Association for the Advancement of Science. Science magazine is one of the premier scientific journals in the country, and has a rigorous editorial review policy. Fewer than 1 percent of papers published in scientific journals follow the scientific method, according to research by Wharton School professor and forecasting expert J. Scott Armstrong. Professor Armstrong, who co-founded the peer-reviewed Journal of Forecasting in 1982 and the International Journal of Forecasting in 1985, made the claim in a presentation about what he considers to be “alarmism” from forecasters over man-made climate change. 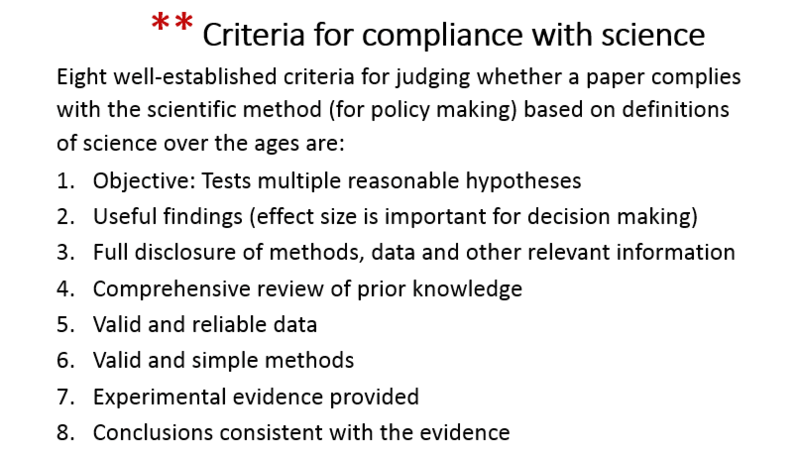 Armstrong defined eight criteria for compliance with the scientific method, including full disclosure of methods, data, and other reliable information, conclusions that are consistent with the evidence, valid and simple methods, and valid and reliable. These criteria for acceptance or rejection of individual papers are a recipe for destruction of scientific research publications because they only oblige a book volume to fulfill the requirement for “comprehensive review” for publication. The scientific method always applied to the collective methodology of science with the key requirement of enabling reproduction of the work and thus enabling refutability. For “comprehensive reviews” one has review articles that are mostly separate from original work. The Armstrong criteria just gave additional weapons to the war on science. Scores of departures by scientists and Silicon Valley technology experts who advised President Trump’s predecessor have all but wiped out the larger White House Office of Science and Technology Policy. Mr. Trump has not yet named his top advisers on technology or science, and so far, has made just one hire: Michael Kratsios, the former chief of staff for Peter Thiel, the Silicon Valley investor and one of the president’s wealthiest supporters, as the deputy chief technology officer. Neither Mr. Kratsios, who has a bachelor’s degree in political science from Princeton, nor anyone else still working in the science and technology office regularly participates in Mr. Trump’s daily briefings, as they did for President Barack Obama. The Energy Department’s Office of International Climate and Clean Energy is now no longer allowed to use language necessary for promoting or even acknowledging the existence of global warming, including phrases “climate change,” “emissions reduction” and “Paris Agreement,” according to a report by Politico. Politico reports a supervisor in the Office of International Climate and Clean Energy told employees of the agency on Tuesday they would no longer be able to use the climate-change language in written communications. In law, treason is the crime that covers some of the more extreme acts against one’s nation or sovereign. Historically, treason also covered the murder of specific social superiors, such as the murder of a husband by his wife or that of a master by his servant. Treason against the king was known as high treason and treason against a lesser superior was petty treason. A person who commits treason is known in law as a traitor. Oran’s Dictionary of the Law (1983) defines treason as a “citizen‘s actions to help a foreign government overthrow, make war against, or seriously injure the [parent nation]”. In many nations, it is also often considered treason to attempt or conspire to overthrow the government, even if no foreign country is aiding or involved by such an endeavor. I propose that this declaration of war against science and scientists – a move completely in conflict with the self-interest of the country – qualifies as treason. However, the present administration was elected in a fair election (discounting Russian intervention). We voted for this administration with the full knowledge of what they intended to do; they are merely fulfilling their campaign promises, so the act of treason is on all of us and we must live with the consequences. We are now approaching the first 100 days since inauguration. Aside from declarations on a variety of topics, there have been few accomplishments in terms of enduring legislation. The president’s popularity is at record low and rumors abound about a coming shakeup in the White House. The president likes to be loved and is desperate to make a positive mark on history. He is also known for his capacity for changing his mind in an instant and operating on instincts. Right now almost everything that has been done to clear the government of science can be reversed in an instant. If this were to take place, amnesty would be in order and we might be forgiven. I am still continuing strongly with Holocaust education and make the same message clear all the time; that government sponsored and organized hatred what brought on the Holocaust and the silence of the majority allowed it to happen. Therefore urge anybody who listens; never let hatred be part of their life and never stay silent when hear see or experience any prejudice or discrimination. Also to remind anybody what George Santayana said; “Those who cannot remember the past are condemned to repeat it.” To remember we must and we do. Again all my best wishes and happy 72nd birthday to all of you. My best regards to all. Be well and I hope you join the resistance effort. Meanwhile, on a more uplifting note, as yesterday was the start of Passover, I wish those who celebrate a happy holiday. I hope you enjoy the fun video below. This entry was posted in administration, Anthropocene, Anthropogenic, Climate Change, law, Trump and tagged Adaptation, amnesty, Anthropocene, anti-science, Armstrong, breitbart, business as usual, cherry picking, Clean Energy, Climate Change, Climate Change Denial, Climate Change Deniers, Climate Skeptics, CO2, CO2 emissions, Consequences, criteria, Data, descrimination, Donald Trump, Economics, EIA, Electricity, Emissions, Energy, Environment, evidence, Fossil Fuels, France, Future, Genocide, George Santayana, Global Warming, Government, Holocaust, house committee on science, IPCC, J Scott Armstrong, Jeffrey Mervis, Lamar Smith, Lemkin, logic, method, methodology, Michael Mann, misinformation, Mitigation, Natural Gas, Obama, Paris, Paris Agreement, Passover, peer review, Physical Environment, Physics, president, president trump, refutability, regulation, Republican, rescue, Science, Science Magazine, scientific journal, scientific method, Scott Wagner, Self Inflicted Genocide, self-inflicted, senator, Sustainability, Toynbee, treason, Trump, US, war on science, white house. Bookmark the permalink.